Experience with us an extraordinary adventure, travelling through time and imagination to the magical 19th century for on afternoon re-animated specially for you! 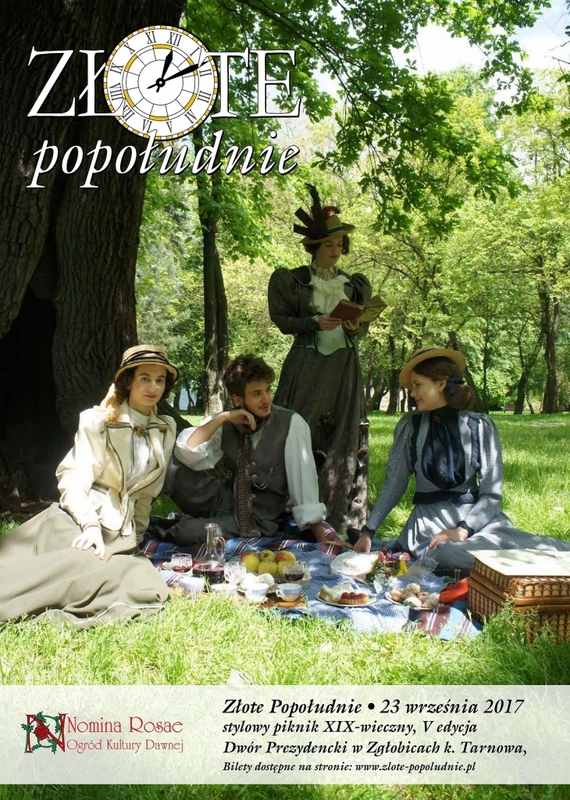 23rd September 2017, stylish 19th-century picnic, President's Manor House in Zgłobice. If you came to our website for the first time and you have no idea what Golden Afternoon is supposed to be – see the Idea tab, where you learn not only what Golden Afternoon is all about, but also, what was happening at the previous picnics. Then is also worth checking the Dresscode tab out, where we've put a handful of inspirations for all those, who'd want to join us in our magical time travel. In the Palace tab you can find details about the venue of this year's meeting and the Programme and Artists tabs will soon fill with information about what and who will appear at this year's Golden Afternoon. If you have any questions click the Contact tab and if you like the idea of the Golden Afternoon and you want to join us – just click the Tickets tab! Embark with us on a journey extra-ordinaire! PS. By following our Facebook fanpage you make sure you don't miss any news!